He was a secret agent, and still alive thanks to his exact attention to the detail of his profession. Simplyreaders will publish during this year a review of the whole 13 James Bond's novels written by Ian Fleming respecting the order of publication. Then, 'Casino Royale' is the first in the list. Le Chiffre is a dangerous man with expensive taste and hobbies and leads the SMERSH cel in Paris. His own excesses will put him in a very compromised situation and he will find on gambling the alternative to his problems. MI6 and CIA are aware of it and will try to thwart his plan. After all, this is a double hit to the Russian counterespionage and to the mafioso's business. We therefore recommend that the finest gambler available to the Service should be given the necessary funds and endeavour to out-gamble this man. 007 is appointed for the mission, unlucky for him, not alone. Backup will be provided and it is a very seductive one. Along with Vesper, Bond will have the support of Felix Leiter, the CIA counterpart who also will appear in subsequent books. The cards are on the table, the chips jump in by the thousands and the jackpot reaches a massive number. Martinis, smokes, sweat, tension and bluffs will keep the reader trapped until the last page with the heart pounding. Ian Fleming not only delighted us with a fantastic plot full of tasty elements that will be taken as a heritage for thousands of fiction thriller writers afterwards, but gave us the foundations of the psychology of the most famous secret agent ever known. ...he wanted to sleep with her but only when the job had been done. Keep an eye on: the details that contribute to create the personality of James Bond. His taste for food, drinks, clothes, weaponry, cars, hobbies, mood, language and of course... women. 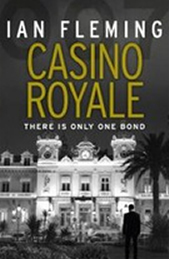 Casino Royale is a classic and the sacred stone of the espionage thriller, therefore, a-must-read t all the fans of this genre as well as Bond's followers.